Matt Orlando, the head chef and owner of Amass, has a seriously impressive culinary CV – he’s cooked in the kitchens of so many top restaurants (Per Se, The Fat Duck, Noma…to name but a few) that the mind boggles and the stomach rumbles at the mention of his name. 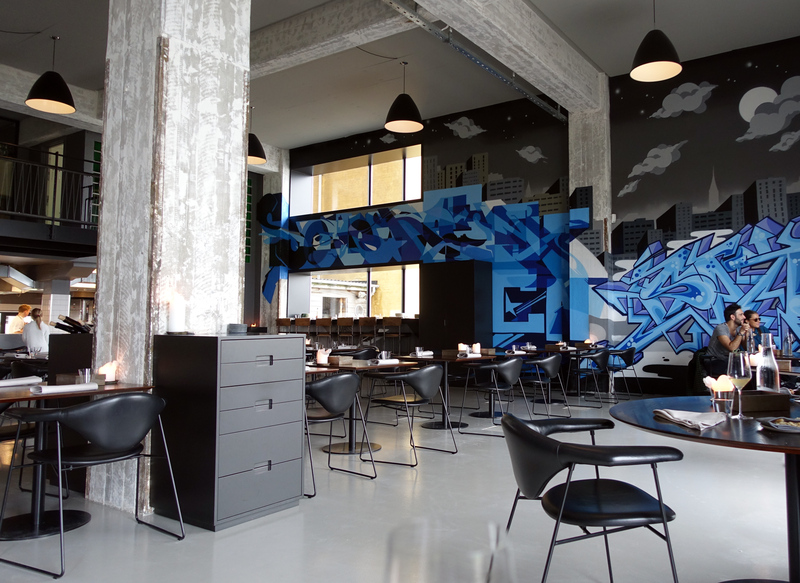 We were really keen to try his first venture which, as with a lot of new Nordic cuisine, focuses on ingredients which can be foraged or are at least local and seasonal (meaning that the menu changes subtly almost daily). 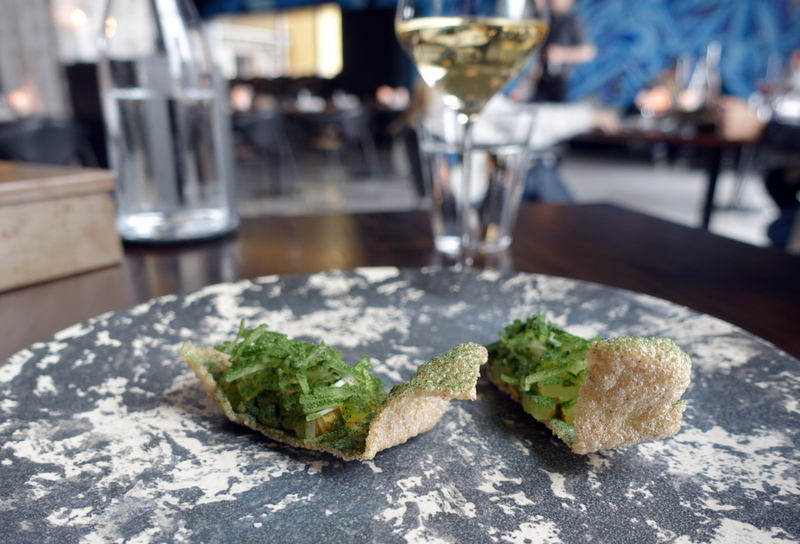 We went for the normal menu – five courses – which started with crystal malt, smoked mussel, coriander seeds and sea lettuce. I liked the mixture of textures in this dish but felt that the flavour of the sea vegetable was somewhat overwhelming. 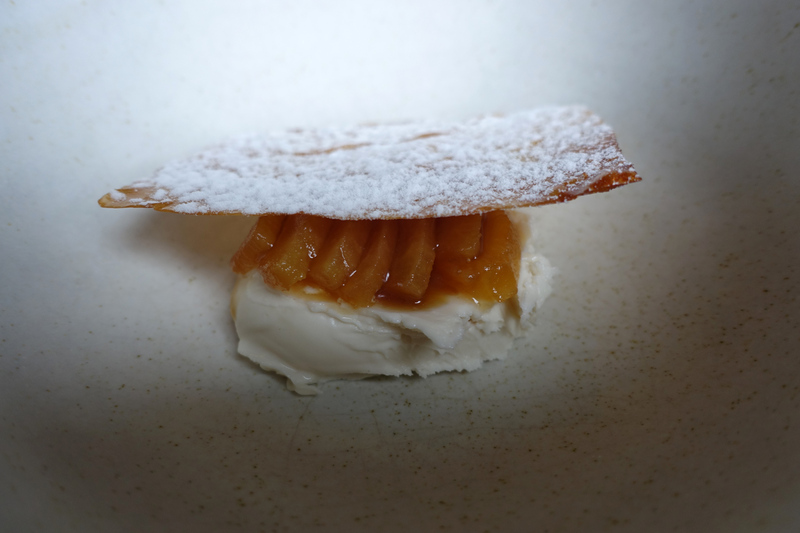 Luckily the next dish (photo at the beginning of the post) was a winner – pumpkin, burnt honey, cultured cream and nasturtium. I’m not usually a fan of dishes where dairy is a main component but decided not to be difficult and swap lots of things out! I’m glad I give this plate a go – the burnt honey cut through the cream perfectly and the nasturtium added both colour and a fresh, natural taste to the dish. 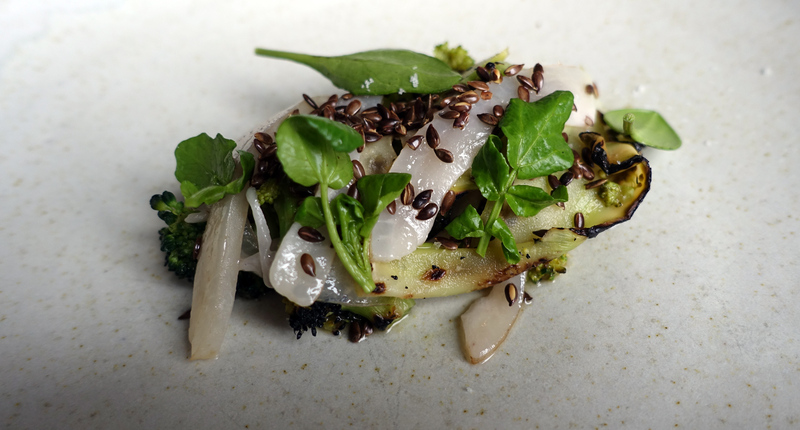 Next up was grilled broccoli, fermented elderflower, pickled pork fat and linseeds. I really enjoyed the combination of the broccoli and the sweet, slightly alcoholic elderflower but the pork fat wasn’t for me…my other half, however, was pretty happy with the richness that it added to the dish. Beets, plums, red seaweed and almond followed. 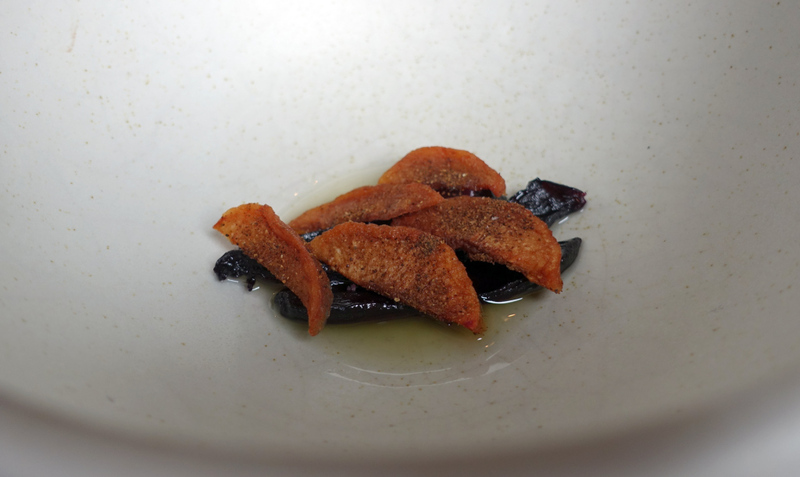 The flavour from the almond oil was pretty overwhelming but luckily that is one of my favourite flavours and I felt that it worked particularly well with the earthy flavour of the beets. I think this was probably my favourite dish of the meal. Served alongside the first few courses was an amazing fermented potato bread. The bread was full of flavour and really dense in texture and had an almost underdone feel about it. It was totally delicious. 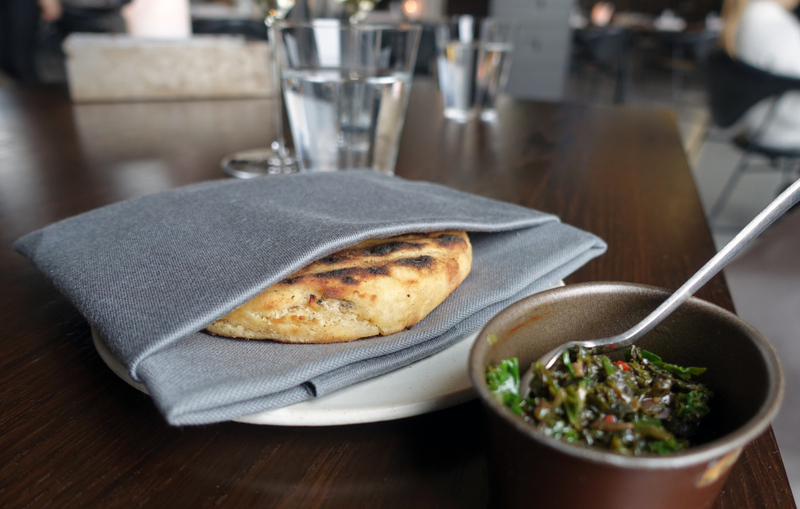 The bread was served with a chilli, kale and oil tapenade which was bursting with amazing flavours. I really enjoyed the change from the standard sourdough and whipped butter combo that seems so fashionable right now (delicious though it is) and might have overdone it a little! 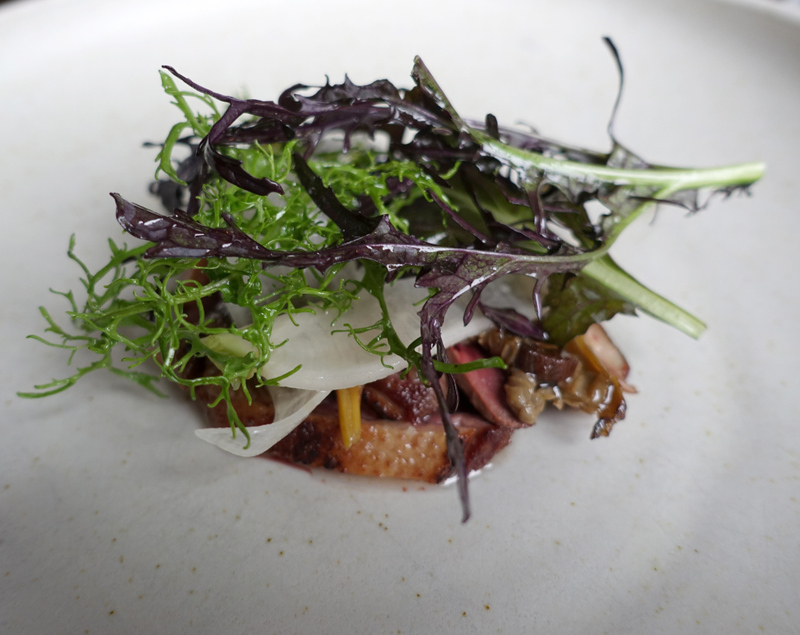 For the main we had wild duck, black garlic, yarrow flowers and funnel chanterelles. The duck was rich, gamey and perfectly cooked – though it had a little too much fat left on for my liking – and the vegetables added even more depth to the dish. For pudding we had apples, yeast, whisky and vinegar. The apples were delicious and the mixture of textures worked well but I wasn’t convinced by the slightly overwhelming yeast flavour. 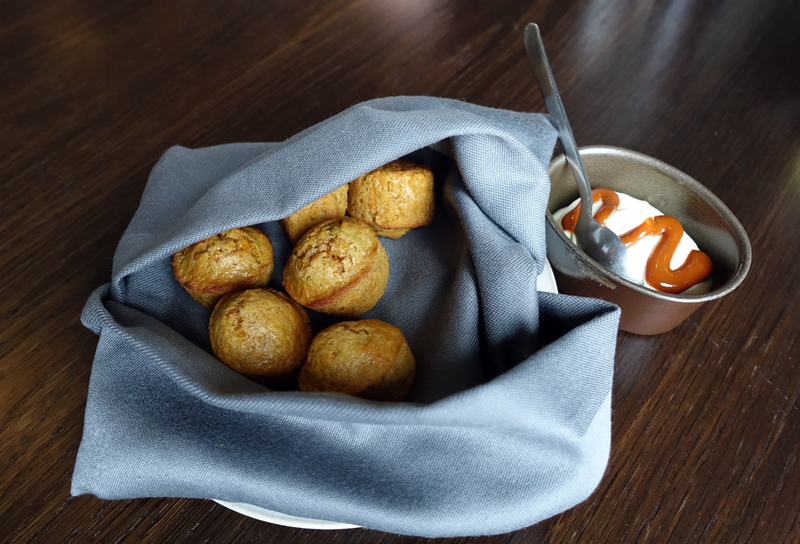 The meal was finished off with some mini carrot cakes. These were a delightful touch (that I really didn’t need as the meal was incredibly filling…or maybe it was the excessive amounts of the delicious potato bread that I consumed) but given that they weren’t stuffed full of sugar and were served with a really refreshing carrot puree and a light honey cream I might have managed to fit in a few! Although some of the flavours weren’t to my personal taste, I really rated Amass. The atmosphere was great and the dishes well balanced and beautifully executed (and incredibly reasonably priced for Copenhagen). Amass can be found at Refshalevej 153, 1432 Copenhagen, Denmark – it is a little out of the centre but we used it as an excuse to take the ferry, a a great way to see the city from an alternative angle. This entry was posted in eat and tagged city break, Copenhagen, Denmark, gourmet, world’s 50 best restaurants. Bookmark the permalink.